I have never, as far as I know, referenced (or very often read) an article from Huffington Post. Their ideas seem very strange to my engineer-and-legal-trained eyes. In short, they don't live in the real world, where engineers must. But I saw a laughable article on HP today, and it calls for a response. Here is the link. What the article claims is that energy efficiency is a sustainable, growing industry that creates jobs. It makes other ludicrous claims as well, but I'll leave those to another day. I have some experience in energy efficiency, quite a bit actually, having been in the industrial side of the world during the energy price shocks of 1973, 1979 and their aftermath. And what I found, as did many others who actually lived through this period, is that energy conservation is a one-time problem. We evaluated the various processes, including homes, apartments, skyscrapers, industrial buildings, shopping malls, and of course industry, and made the appropriate energy-conserving investments. By doing so, over approximately five years, the refining and chemical industries reduced energy consumption per unit of production by more than 30 percent. That was a laudable achievement, and I am proud to have been a part of that. But what we also found was that, even if more money were spent, there would not be another 30 percent reduction over the next five year period, then another 30 percent in the following five years, and so on. Energy consumption, and energy efficiency, does not work that way. It seems obvious to me, as an engineer, but this seems to escape the notice of the many misguided folks who see sustainability and conservation as a jobs-creating industry that we should have been doing all along. The reason that energy conservation does not work "that way" is that there are certain fundamental, physical realities in the real world. As an example from everyday experience, consider two kids, with a wagon that has four wheels. One kid sits in the wagon, and the other kid pulls the wagon with the kid up a hill. That takes work. Let us assign the amount of work, or energy expended by the kid doing the pulling, a value of 100. Then, let us see what can be done to reduce the energy expended, or "conservation." For this example, we can assume the kid in the wagon was wearing very heavy boots, and had rocks in his pockets, and was wearing a weight belt. Why, we don't need to ask. The point is that less energy will be expended if there is less weight in the wagon, so we can remove all the unnecessary weight: boots, rocks, and weight belt. Now the next trip up the hill, the kid pulling will expend only 90 units of energy. Good, we have conserved 10 units of energy. What else can be done? Perhaps the wheels do not roll smoothly because the axles are rusty. This takes more energy to pull the wagon. We can install new axles, and lubricate them with grease, or even install roller bearings in the wheels to reduce the friction. This costs money, but it can be done. Perhaps the wagon now requires only 85 units of energy to make it up the hill. Next, perhaps the tires are not perfectly round, or do not have the proper synthetic rubber to roll more easily, so we replace the tires with low rolling-resistant tires that are more nearly round. Again, this costs money but it can be done. Perhaps now the wagon requires only 80 units of energy to make it up the hill. And we are done. There are few, if any things that can be done to reduce energy consumption beyond this point. We reduced energy 20 percent, which is good. But to expect that an additional 20 percent reduction will be done in the next round of effort is expecting too much of physics. This is because, even if we had a perfectly friction-less method of transportation, a certain amount of work must be done to move a mass over a distance, and up an incline. No amount of energy conservation techniques will reduce that, no matter what well-meaning people who fervently believe in conservation may say. Physics does not care what people babble on about, or what laws are passed, or which trees are hugged and which are removed for highways. Similarly for houses, which can have energy reduced by improved insulation, plugging air leaks, and installing better windows, once the house has had that first round of energy conservation applied, that is it. No more improvements, unless a new house is built with radical new design. One might install solar panels, or a ground heat pump, but this is not possible or practical in many areas of the world. It is certainly not economically attractive in many areas, even if it is possible. And, even if all that is done with a new house, solar panels, and the like, one is still done at that point. No more energy efficiency will occur. For transportation systems, such as cars, trains, trucks, ships, and airplanes, there are a few more things one can do, but not many. One can, for example, design and install more aerodynamic devices on vehicles to reduce wind resistance ("drag" in aerodynamics terms). This might achieve 5 or 6 percent less fuel used. One might also install improved engines, hybrid systems to recover the energy lost as heat while braking, low-friction oils, low-weight alloy wheels, low rolling-resistance tires, variable transmissions, and reduce average speed, but once those things are done, you are done. There will be no additional "conservation" to reduce energy consumption any further. To get a bit technical, in the refineries and chemical plants in which I worked for so many years, there is a theoretical amount of energy that must be expended to accomplish the task at hand. At the most fundamental level, chemists and chemical engineers speak of the "heat of formation." This is the amount of energy, or heat, that must be expended to convert one substance, a chemical, to another. In addition to that basic minimum energy requirement, there are energy requirements for bringing the raw materials to the plant, pumping, heating, separating the desired materials from the dregs, cooling the material, packaging when appropriate, then transporting and distributing the products. Each of these steps (and there are many, many other steps not included here) requires energy, and is subject to the laws of physics. No amount of effort by any person, no matter their IQ, will result in energy efficiency gains of 30 percent every 5 years or so. So, I laugh when I read drivel such as that on the HP column mentioned above. On the one hand, it might be fun to watch as nation after nation, and state after state, passes laws such as AB 32 in California, that requires energy use to be reduced by government fiat. Physics, however, is not impressed by any king, president, prime minister, governor, EPA Administrator, or chair of an Air Resources Board. Physics is certainly not impressed by judges who uphold such laws. Engineers have limits on what we can do. We achieved 30 percent energy reduction 30 years ago. To accomplish what California says must be done, 80 percent below 1990 CO2 emissions by 2050 (the "80 by 50" rule), requires that only 7 percent of the greenhouse gases can be emitted compared to the business as usual case for 2050. That means a 93 percent reduction (see Figure 1). 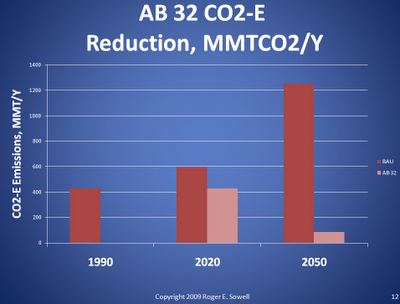 The two bars above "2050" on Figure 1 show the Business as Usual case, of a bit more than 1,200 MMTCO2/yr in the dark red, and the California-mandated requirement in the lighter color, of about 87 MMTCO2/yr. This chart is not presented by ARB or any other official presentation, to my knowledge, and with good reason. That 93 percent reduction is daunting, to say the least, and impossible, considering physics. As I said above, a 93 percent reduction by 2050 is required by regulation. Good luck with that. Physics is not impressed with such regulations. It is, of course, understood that not all the energy efficiency and conservation will be done for all possible targets within 5 years. But eventually, those targets will be done. And then what? This movement is supposed to be sustainable and provide jobs into the forever-future. The stark reality is that this is impossible. It would be nice, fabulous even, if legislators understood this fundamental point. Then they would be far less prone to pass such idiotic laws. Great post, Roger. I have read a very similar line of argument a few years ago in a German newspaper. I think it was BASF who protested against certain political targets calling for something like a 20% CO2 emissions reduction. Their factories were a labyrinthine web of tubes, using waste heat from one process to power another, using byproducts of one process as raw material for the next, optimized for maximum efficiency for decades. They did all this without political pressure, just to become more competitive and, being German, out of their love for perfection i think. They saw no way to achieve a further 20% gain, and these were without doubt the most knowledgeable experts in the field.